FOR DETAILED INFORMATION ABOUT RICAS AND TESTING AT TAPA CHECK OUT THE SLIDE PRESENTATION SHARED WITH FAMILIES AT THE 3/13 PARENT ENSEMBLE MEETING. A shout out to Dennis’ mom, for winning our FIRST Dunkin’ Donuts gift card! Go @mamarosales!!! A shout out to our SECOND Dunkin' Donuts gift card winner! Great job Madriaga Family!!! TAPA IS ON THE MOVE! Our TAPA Ensemble includes federal employees and others who are not being paid due to the partial government shutdown. Any TAPA family that's been affected by the shutdown may qualify for free meals through the National School Lunch Program. If your income has been impacted by the shutdown, please reach out for a meal benefit application to see if your children qualify for free or reduced-priced lunch. As always, all TAPA students qualify for free breakfast and snacks at school. All families facing pressures during the shutdown are also encouraged to reach out to our Family/Community Liaison, Zuleika Vidal, who may be able to provide additional support. La comunidad de TAPA incluye empleados federales y otros quienes no han recibido paga debido al cierre parcial del gobierno. Cualquier familia de TAPA que haya sido afectada por el cierre pueda que califique para recibir almuerzo gratis a través del Programa Nacional de Almuerzos Escolares. Si su ingreso ha sido afectado por el cierre, solicite una solicitud de beneficios de comida escolar para ver si sus hijos califican para almuerzo gratuito o a precio reducido. Como siempre, todo estudiante de TAPA califica para desayuno y merienda gratis en la escuela. También exhortamos a las familias experimentando dificultad durante el cierre a comunicarse con nuestra Coordinadora de Enlace Familiar y Comunitario, Zuleika Vidal, que puede proporcionar apoyo adicional. Come See Civics in Action at TAPA! ¡Venga y Vea Educación Cívica en Acción en TAPA! As you may know, a federal lawsuit has been filed that accuses Rhode Island of failing to provide students with the skills they need to participate effectively in a democracy. We are aware of this lawsuit, and are following it closely. This year, junior Raymond Baccari set the goal of interview every major Rhode Island politician before he graduates in 2020. So far, Raymond has brought Mayor Elorza, Representative Cicilline, Senator Whitehouse, and others to TAPA for in-depth political interviews. All our students participate in state and national politics. We do voter-registration and many of our seniors cast their first vote in this year’s midterm elections. Our students are also involved with social justice movements, including the March for our Lives and the PRONK! Festival. Additionally, we are active with RI civic community partners, including Roger Williams's School of Law, RI Law Day, The Brown University Masters in the Art of Teaching Social Studies department, Secretary of State Nellie Gorbea, and The Rhode Island Historical Society. We invite our TAPA families to visit our Historical Perspectives classrooms any Wednesday during the month of December to come and see civics in action at TAPA. As always please feel free to reach out to any one of the instructors with specific questions. We are proud to be your TAPA educators and thrilled to build the states strongest historical program along with you. Colectando Información Sobre el "TAPA del Futuro"
NEW TAPA GEAR ITEMS JUST IN TIME FOR WINTER MONTHS & HOLIDAYS! ¡NUEVOS ARTICULOS JUSTO A TIEMPO PARA EL INVIERNO & TEMPORADA NAVIDEÑA! Please contact Mr. David Sousa or stop by the main office to place an order. The TAPA Community Band Wants You! Do you sing, play an instrument, have an appreciation for rock? Join us Wednesday, October 31st at 4-5:30pm and lets rock out together!!! ¡La Banda Comunitaria de TAPA Te Quiere a Ti! ¿Cantas, tocas un instrumento, aprecias el rock? ¡Únete a nosotros el próximo Miércoles, 31 de Octubre de 4-5:30pm y vamos a rockear juntos! TAPA Welcome Back Potluck Picnic CANCELLED due to weather conditions. New date TBD - Stay tuned! Picnic de Bienvenida de TAPA CANCELADO debido a condiciones del clima. Nueva fecha a ser determinada - ¡Mantengase alerta! IS TAPA GEAR THE NEW TAPA UNIFORM? TAPA has adopted a new Dress Code. Uniforms are no longer mandatory. IS PURCHASING TAPA GEAR MANDATORY? Purchasing TAPA Gear is not mandatory. 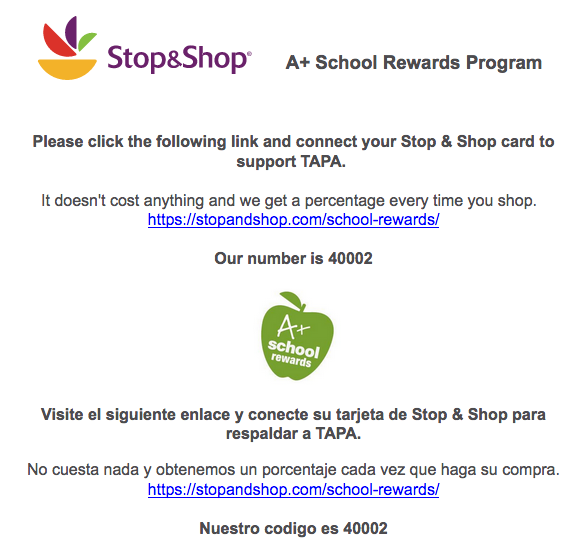 Students and families may choose to purchase available items through the school to show TAPA pride! HOW DO I ORDER TAPA GEAR? Complete an order form, choose desired items and return to the school with payment. Order Forms are available at the main office or from Mr. Sousa, Dean of Students. Cash or Check. Please make checks out to TAPA. CAN I PLACE AN ORDER AND PAY LATER? No. Orders must be accompanied by full payment. No order will be placed without payment. WHAT IS THE ORDER TURN AROUND? Orders are placed the day they are received and take 2-3 weeks to come in. CAN ORDERS BE PLACED THROUGHOUT THE SCHOOL YEAR? WILL TAX BE CHARGED ON ORDERS? The prices marked on the order form is the total price per item. No additional charges will be added to the order. IS THERE A DISCOUNT FOR FAMILIES PLACING ORDERS FOR MULTIPLE STUDENTS? DOES THE PRICE PER ITEM INCLUDE THE SCHOOL LOGO OR CREST EMBROIDERY OR SCREEN PRINTING? WILL OTHER ITEMS BE AVAILABLE FOR PURCHASE IN THE FUTURE (knee highs, beanies, scarves/gloves, sweatpants)? We are working on adding new items once the school year starts. CAN ORDER ITEMS BE CUSTOMIZED TO CONTAIN MORE THAN JUST THE LOGO OR CREST (student name, graduation year, arts major)? Please contact Mr. Sousa, Dean of Students, if you have any more questions about TAPA Gear orders, 401-432-7881, mr.sousa@tapaprovidence.org. ¿ESTA NUEVA MERCANCÍA DISPONIBLE ES EL NUEVO UNIFORME DE TAPA? TAPA ha adoptado un nuevo código de vestimenta. Los uniformes ya no son obligatorios. ¿EL COMPRAR ESTA MERCANCÍA ES OBLIGATORIO? El comprar estos artículos no es obligatorio. ¡Los estudiantes y familias pueden elegir comprar artículos disponibles a través de la escuela para mostrar el orgullo de ser parte de la comunidad de TAPA! ¿CÓMO PUEDO HACER UNA ORDEN? Complete el formulario de pedido, elija los artículos que desea comprar y regrese el formulario a la escuela con la cantidad debida. Formularios de Pedido de Mercancía Escolar pueden ser adquiridos en la oficina de la escuela o a través de Mr. Sousa, Decano de Estudiantes. ¿QUÉ MÉTODOS DE PAGOS SON ACEPTADOS? Efectivo o Cheques. Favor de hacer cheques a nombre de TAPA. ¿PUEDO HACER UN PEDIDO Y PAGAR DESPUÉS? No. Los pedidos deben ser acompañados por pago en su totalidad. El pedido no se realizará sin el pago total. ¿CUÁNTO TIEMPO SE TARDA EN RECIBIR LA ORDEN? Su orden será hecha el día que sea recibida. Ordenes toman de 2-3 semanas para llegar. ¿PUEDEN HACERSE PEDIDOS A TRAVÉS DEL AÑO ESCOLAR? Si, en cualquier momento durante el año escolar. ¿SE AGREGARÁ IMPUESTOS A LOS PEDIDOS? El precio listado en el formulario de pedido es el costo total por artículo. Cargos adicionales por impuestos no serán agregados a la orden. ¿HAY UN DESCUENTO PARA FAMILIAS HACIENDO PEDIDOS PARA MÚLTIPLES ESTUDIANTES? ¿EL PRECIO POR ARTÍCULO INCLUYE LA SERIGRAFÍA Y BORDADO DEL LOGO E INSIGNA ESCOLAR? ¿HABRÁN OTROS ARTÍCULOS DISPONIBLES PARA LA VENTA EN EL FUTURO (medias, gorros de lana, bufandas/guantes, pantalones de sudadera)? Estamos trabajando en agregar nuevos artículos una vez que comience el año escolar. PUEDEN SER LOS ARTÍCULOS PERSONALIZADOS A INCLUIR MÁS QUE EL LOGO O INSIGNIA ESCOLAR (nombre del estudiante, año de graduación, concentración the arte)? Favor de comunicarse que Mr. Sousa, Decano de Estudiantes si tiene alguna pregunta sobre los pedidos de la Mercancía Escolar de TAPA, 401-432-7881, mr.sousa@tapaprovidence.org. Non-perishable food items and canned goods available for TAPA families. Boxes are prepared and distributed once a week. (Pasta, canned spaghetti, fruits and veggies, mac & cheese, tomato sauce, peanut butter, rice, cereal, etc.) Packaged items can be picked up by families or sent home with students. Families wanting to take advantage of this program should contact Ms. Vidal at 644-7657, ms.vidal@tapaprovidence.org. Desktop computers and access to internet available for parent use Monday-Friday. Parents can access the internet to job hunt, email, research, study, accessing online courses, communicating with teachers, etc. Printing of important documents also available. Contact Ms. Vidal to schedule technology access, 644-7657, ms.vidal@tapaprovidence.org. Information, access to community resources and referrals available for displaced families staying in shelters or doubling up with family members or friends. Academic support available to TAPA students of families experiencing homelessness. Please contact Ms. Vidal for more information, 644-7657, ms.vidal@tapaprovidence.org. TAKE THE FAMILY SURVEY NOW! ¡TOME LA ENCUESTA FAMILIAR AHORA!